Artwork is printed at high resolution with vivid color on thick high quality canvas to create the look and feel of the original nature and masterpiece. Picture is already perfectly stretched on thick wooden frame.The side margins are also printed to create a particularly decorative effect. Canvas Wall Art is the modern way to brighten the walls of your home, and relax you after work.It is sure to captivate wherever it is hung. About Giclee Prints There are at least Three basic criteria, which must be met in order for the print to be considered a true giclee... 1. For giclee printing, the paper or substrate used to actually print the final piece must be acid free and consists of a 100% cotton base. 2. Any image that is to be printed as a giclee needs to be created at a resolution of no less than 300 dots per inch (DPI). This is to ensure that the final print has the sharpest detail and lacks any of the fragmentation that can occur with images less than 300 DPI. 3. The last step to creating or confirming a true giclee print is the type of ink and printer used. The biggest contrast between a standard inkjet print and a giclee print is that giclees are printed using pigment-based inks rather than the dye-based inks found in lower cost inkjets. Pigment-based inks have a longer life span that can last anywhere from 100 to 200 years without significant fading. 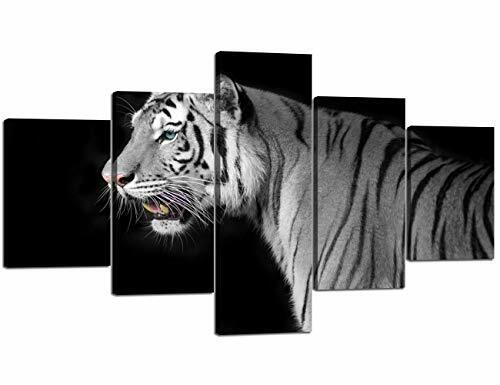 [Size]There are 5 separate canvases, Total Dimension :60''W x 32''H; Each panel size: 12''W x 16''H x 2,12''W x 24''H x 2,12''W x 32''H x 1. [Quality]High Definition Giclee modern canvas printing artwork, picture photo printed on high quality canvas.A great gift for your relatives and friends.Add some creativity to your project! Bookmarks - Set of 10 different bookmarks created from original watercolors. Animal Bookmarks Hummingbird, Fox, Bumble Bee, Owl, Raccoon, Honey Bee.